First, an exciting announcement: I'm pregnant. Ok. I'm not pregnant. I just haven't used that never-was-funny-in-the-first-place-why-is-it-a-repeat joke in a while. Although, it's kind of truer today because I was in a car for six hours and I had to pee so much that I swear I actually started having contractions. I know what those are since I've recently experienced the full range of parenthood and every single responsibility that comes with it because I adopted my puppy in February. Where was I. Oh, yes: an exciting announcement that has nothing to do with my nonexistent ovaries. 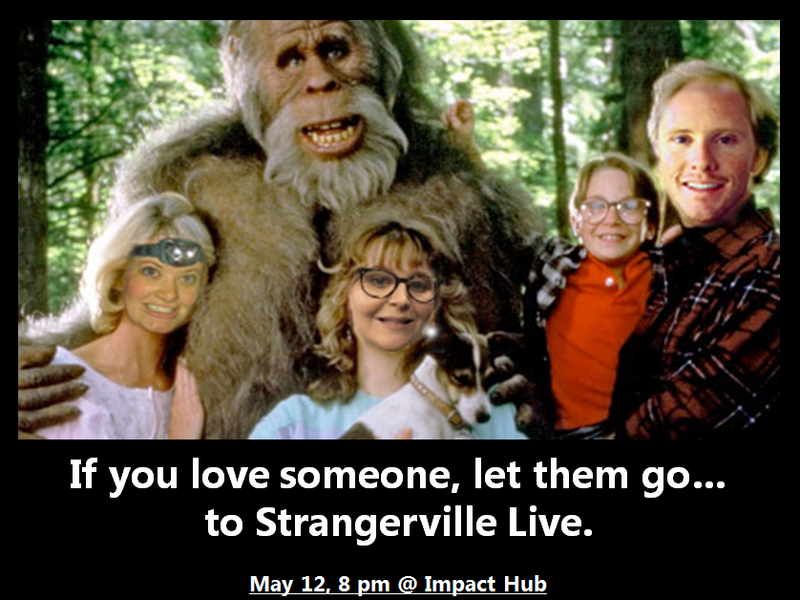 We are hosting a second Strangerville Live show in Salt Lake City, at Impact Hub, on Friday May 12, at 8:00 PM. 1. Sara Hanks: TV & Jelly contributor, former writer for Feminist Mormon Housewives, occasionally shakes head disappointingly at me during TV & Jelly Podcast recordings. 2. Craig Hanks: Host of The Legendarium Podcast, TV & Jelly contributor, possesses enough Zelda materials to end all dating for everyone. 3. Rachelle Young Pearson: Strangerville storyteller (The World of Guardians--the grandma bed-making story), overworked mother, once got me put into detention in the 8th grade and I have never forgiven her for this. 4. Eli McCann: The guy who started this announcement by telling you he's pregnant. We'll have music, good company, bad company, all the kinds of company, appearances by the ever lovely Jolyn Metro and Meg Walter, and a nervous Bob & Cathie on the 7th row, wondering if their offspring is going to embarrass them. Please get your tickets today at the below link. We understand that last time the site we used for tickets apparently charged you like a $700 service fee, plus your first-born child. So we're using paypal this time, even though it looks jankier. Like last time, we have a limited number of seats, so please get tickets now. Also, in case you needed any further motivation to come to our show, Skylar spent an unfortunate amount of time making this. Eli: What is this for? Eli: No, I understand that. But why did you make it? What's it for? Skylar: Because it's Megward instead of Edward. Eli: How much time did you spend on this? Skylar: Only like 2 hours. Then he went on this whole thing about how Meg has a "flawless face" and "I know because I looked at this picture for 2 hours" and "look at that bone structure" and now I think Skylar may start a cult and it's all thanks to Photoshop. So yeah. Come to our show please. And bring friends. I will personally sing to you if you do this. IN SPANISH. Oh my goodness. Gah. I wish we could go, Ames! Forget Bali!!!! We need to go to SLC! Ok so now I am faced with the decision of a lifetime: Bali/Indonesia with my sister for our brothers wedding, or an accidental totally impromptu and unplanned trip to Salt Lake City with tickets in my pocket and a vague but binding promise to be personally (dare I say) serenaded to by Eli McWhittlebottom himself... my momma told me there would be days like this, but she never taught me how to choose! Hmm, well no time to figure it out, I have to take my kids to school. Then go to yoga. Then visit a friend. Today is shaping up to be a very interesting day. I didn't even have to read the lineup before going scrolling as fast as possible to the checkout button. This will be legit and I am really so loving that you guys do this. Hello fellow Texan! I'm a Texan as well, although I am unfortunately not living there at the moment. Maybe if enough out-of-state Strangers comment than we can induce Eli with more incentive to take Strangerville Live on the road! From Nebraska, I will vote for a show in Texas, as long as it is more North-y Texas. I'm North-y Texas!! Texas! Texas! Texas, y'all!!!! Well how can I not go after that amazing Harry and the Henderson's picture? BTW, that movie haunted my childhood. That part where he comes down the windshield? I still think it's the scariest movie scene of all time. Wow, you guys are so awesome for planning another show for my birthday!!! Unfortunately, I live all the way in Mississippi right now, so I'm not going to make it. But thanks for thinking of me! Also, as a currently pregnant person, I can state with confidence that being pregnant is no joke. Ugh. The things we do for our children. I'm fairly certain that there will be a massive late season snow storm on that day that will close all roads between SLC & Logan if I attempt to buy a ticket in advance. But what the heck, let's test the limits of Murphy's Law. I wonderfully misread one line thusly: "appearances by the ever lonely Jolyn Metro." I am so there this time. 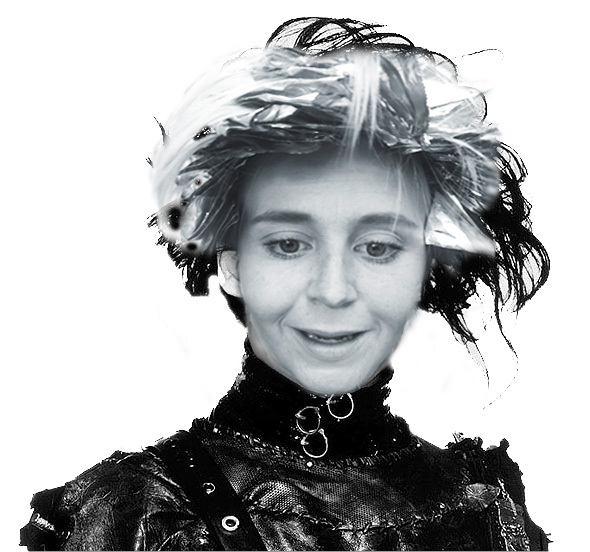 So excited that you are doing another show!